A 21-year-old driver has been sentenced to 10 months' home detention after injuring a group of school students when he ploughed into them at a North Shore bus stop. Along with home detention, he was sentenced to 250 hours' community work, ordered to pay $18,500 in reparations and was disqualified from driving for two years. 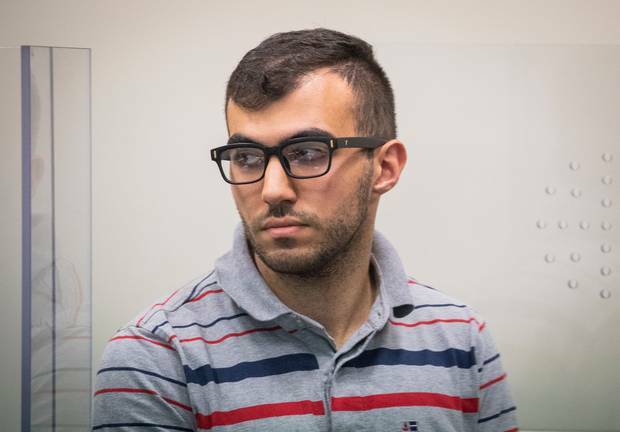 Michael Abou Chaaya, 21, appeared in North Shore District Court today before Judge Pippa Sinclair. He pleaded guilty to the six counts of dangerous driving causing injury in August last year after he injured the group of students at a bus stop outside Westlake Girls' High School on Auckland's North Shore at 8.20am on September 20, 2017. Abou Chaaya was driving along Taharoto Rd when he crossed the intersection of Shakespeare and Wairau Rds, the summary of facts said. The court heard he accelerated heavily and passed several cars, weaving between lanes, travelling at a minimum of 87km/h in a 50km/h zone. While driving at speed he failed to negotiate a moderate left-hand bend and lost control of the vehicle. He then mounted the kerb and drove 20m along the footpath. One of the victims was carried on the bonnet of Abou Chaaya's car before being flung down a nearby embankment. 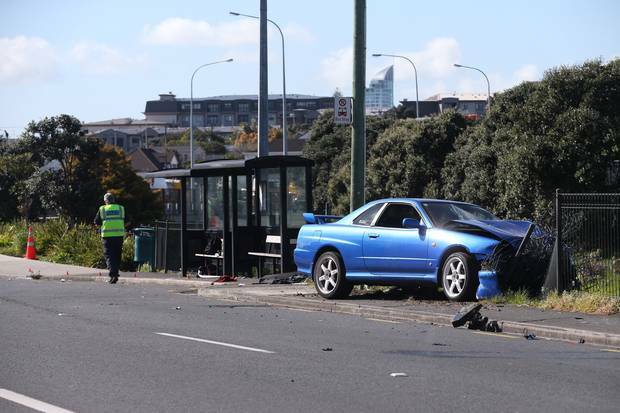 The car mounted the footpath and crashed through a barrier fence on Wairau Rd before ploughing into the students from Westlake Girls' and Boys' High Schools. Six students were hurt. One suffered critical injuries and another was seriously injured. 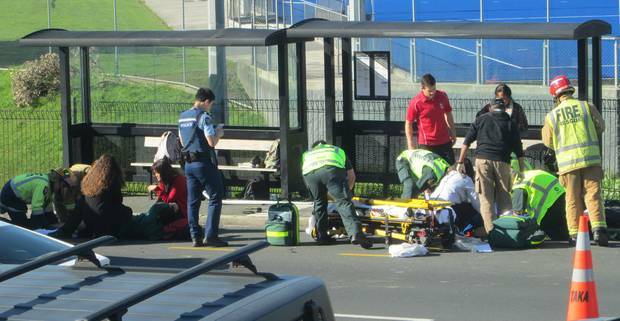 Three of those hospitalised were Westlake Girls' High students and one was from nearby Westlake Boys' High School. Injuries suffered by the students included two broken femurs, a broken ankle, concussion and nerve damage. One of the victims spent a month in Starship Children's Hospital and two months in a rehabilitation centre, where she had to learn to walk again. Today, five of the injured students and their families were in court to hear the verdict of Abou Chaaya's sentencing. Before court began, one of the victims shook hands with Abou Chaaya and wished him good luck. Abou Chaaya was also supported by his parents and friends in court. In court the victims chose to read aloud their victim impact statements. The first victim's statement, read by a Victim Support supervisor, said she could not remember anything from that day despite it being 14 months later. "However, when I look and me and my friends' scars it reminds me of what happened on that horrible day," she said. The victim said she spent five days in hospital after suffering a broken ankle and chipped shoulder blade. "I felt like a dead person walking around trying to go to the toilet etc," she said. "My family suffered a lot. My dad wasn't able to work as he had to look after me. We are going to suffer for the rest of our lives." The second victim chose to have her mother read out her statement. "I just wished that you had slowed down," she said. The victim suffered a dislocated left arm, a broken pelvis and femur, as well as torn ACL joints and broken ligaments. "Not being able to physically move was one of the hardest things I have been through," she said. "It was so frustrating and infuriating. At times I feel like giving up. I used to be happy and carefree – I don't feel like that anymore. "I envy you so much because at least you are able to walk and do things on your own." The victim said being in hospital and facing rehabilitation was "the most loneliest time ever", however, she had learned to forgive Abou Chaaya for "the pain he has cost me and my friends". Another victim said that morning just seemed like every other morning but it "changed our lives like we could have never expected". "It has taken a massive toll on my life… It affected me emotionally and mentally," she said. She described how the smell of burning rubber and freshly mown grass both haunt her as reminders of the crash. "I just want this to be over and done with … I don't want to be living the moment over and over again," she said. The last two victims described how the crash had a huge mental impact on them and had severely affected their schoolwork. "That day has impacted me emotionally on so many levels. My mind is constantly on the tragic accident and what I could have done to help," one said. Crown prosecutor Farrukh Gul Qaisrani said it was consistent through all these impact statements that the victims had suffered not only physical effects, but emotional effects - "that could possibly be life-long". He also argued that Abou Chaaya had been inconsistent in his testimony. "The defendant gave different versions of what caused the accident. At one stage he said it was probably a bug, and then at another stage he said it was the brakes, and then it was a car trying to merge into his lane," he said. Abou Chaaya's lawyer Geoffrey Anderson said he and his family had taken the case very seriously and were entirely and utterly remorseful. "My client is extremely remorseful," he said. Anderson said Abou Chaaya travelled the road often and simply made some dangerous decisions on this day. "The genesis of the incident was speed and inattention," he said. Anderson apologised to the victims on behalf of his client and said Abou Chaaya had been highly stressed by what happened. Judge Pippa Sinclair said this was an "event born of nightmares". Any sentence imposed would do little to relieve any suffering felt by the victims, however, it needed to deter Abou Chaaya and others from reoffending. When making her decision, Judge Sinclair took into account Abou Chaaya's speed, the school district in which he was driving, and the time of day - which meant it was peak-hour traffic. "Not only did you speed, you undertook several risky and dangerous manoeuvres. It was unsurprising you lost control - this was an accident waiting to happen," she said. Sinclair said the victim impact statements were upsetting and distressing. "Parents of each of these children received a call every parent dreads," she said. Sinclair accepted Abou Chaaya's remorse, saying he had learnt a very difficult lesson with consequences that would last a lifetime. She sentenced Abou Chaaya to 10 months' home detention, along with 250 hours of community work. He was also ordered to pay $18,500 in reparations to the victims and was disqualified from driving for two years.